Digital UltraViolet and Digital Copy will makes it possible for you to stream the movie The Spy Who Dumped Me HD UV or iTunes Code instantly to your computer and compatible Smartphones, Andriod, iphone, iPod Touch, iPad and tablets devices anytime, anywhere. 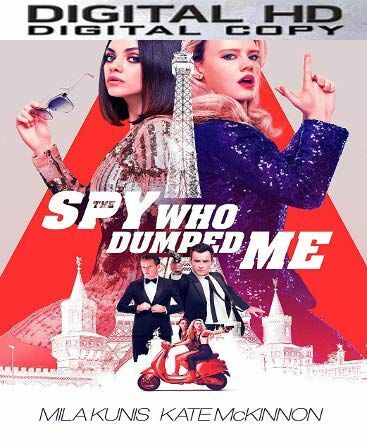 You can also download a Digital UltraViolet Copy or a Digital Copy of the movie The Spy Who Dumped Me HD UV or iTunes Code to your computer and compatible devices. Audrey (Mila Kunis) and Morgan (Kate McKinnon), two thirty-year-old best friends in Los Angeles, are thrust unexpectedly into an international conspiracy when Audrey�s ex-boyfriend shows up at their apartment with a team of deadly assassins on his trail. Surprising even themselves, the duo jump into action, on the run throughout Europe from assassins and a suspicious-but-charming British agent, as they hatch a plan to save the world.